Lightroom Bookstore is a veritable Narnia for children’s tomes. 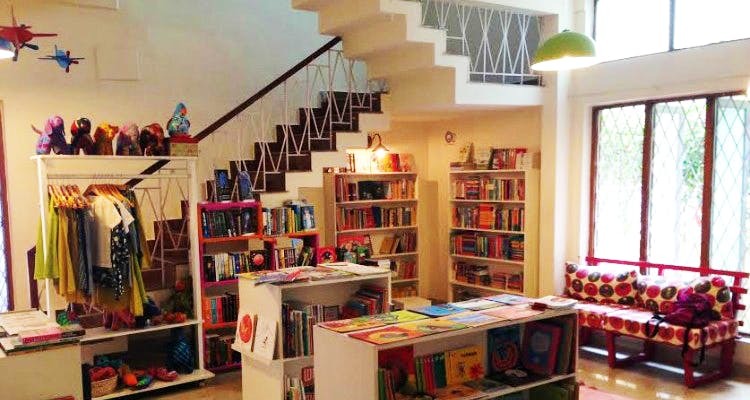 This tiny, stand-alone bookstore is very well curated, and has something for everyone including kiddie-book loving adults too! The delight you feel when stepping into Lightroom Bookstore is comparable to what we think Lucy Pevensie might have felt when she crawled through the cupboard to reach the magical world of Narnia. You can’t help but be spellbound as you walk through the inviting space, surrounded by books and more books. Lightroom has a range of international and Indian books for children and young adults. Apart from the usual suspects such as Harry Potter, Julia Donaldson, and Percy Jackson, there’s The Amazing Remarkable Monsieur Leotard by Eddie Campbell and Dan Best, Miss Peregrine’s Home for Peculiar Children by Ransom Riggs, and Paper Planes by Dawn O’Porter. There are books published by Tulika, Hachette, Tara, Katha, Pratham, Duckbill, Red Turtle, Puffin, and Young Zubaan, selected by the team at Lightroom. One wall looks like it belongs on the page of Brain Pickings, Maria Popova’s literary and cultural website. Here you will find displayed the gorgeously-illustrated Animalium: Welcome to the Museum by Katie Scott and Jenny Broom, Neil Gaiman and Chris Riddell’s The Sleeper and the Spindle, and I’ll Be You and You Be Me by Ruth Krauss and Maurice Sendak. We spent a fair amount of time on the floor perusing Knock! Knock! by Kaori Takahashi. Some of the Lightroom team members joined us in unfolding the beautifully-crafted book. When we gushed over The Giant Game of Sculpture by Hervé Tullet, they opened the book, which transformed into a DIY installation for budding artists. You can also buy notebooks, block stamps and DIY craft kits, apart from kids apparel by Hidden Harmony and hand-stitched toys by Blue Mango. Lightroom also holds two events per month. What makes Lightroom special is its people. Mudnani and her helpful team are knowledgeable and unobtrusive. Need a book for a ten-year-old who loves monsters, a birthday gift, or a first book for your toddler, they know just what you want. And they even smile approvingly if you confess that the book’s actually meant for you.